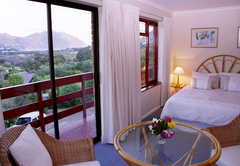 Luisa House is a highly recommended Hout Bay Bed & Breakfast providing accommodation in 4 guest rooms for tourists visiting the Atlantic Seaboard region. 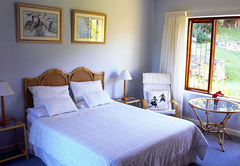 Situated just 20 minutes from Cape Town, this delightful Bed & Breakfast, Luisa House, is set in a lush garden and offers beautiful views of sea and mountains. 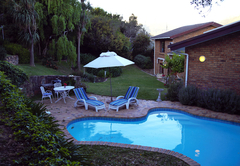 This delightful bed and breakfast, Luisa House, is set in lush tranquil gardens with commanding views of surrounding mountains and sea. Four spacious en suite bedrooms with private entrances, each have television, bar fridge, tea and coffee trays. Enjoy a full English or continental breakfast, served outdoors if requested. 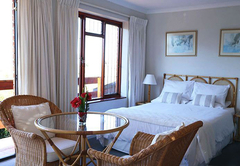 Situated 2 kilometres from the beach, Luisa House is also close to excellent restaurants specialising in seafood and centrally situated for day trips to Cape Point and the Cape Winelands. 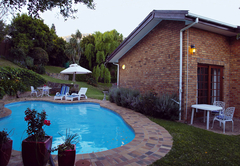 Approximately 35 to 40 minutes to the Airport and only 20 minutes to Cape Town City and the Victoria & Alfred Waterfront. Local attractions include boat charter, excursions to Seal Island, horse riding and mountain walks. 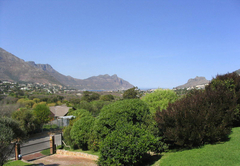 Close to the fishing harbour and famous World of Birds Sanctuary. 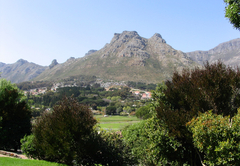 Other easily accessible attractions are Table Mountain by cable car or hiking, and Kirstenbosch Gardens. Local attractions include the World of Birds Wildlife sanctuary, horse riding, boat charters and day trips to Seal Island. Four spacious en suite bedrooms with private entrances, each have television, bar fridge, tea and coffee trays. Enjoy a full English or continental breakfast, served outdoors if requested. Good Day I am Hameeda and we stayed with Trish for the weekend, it was the best ever. Being greeted as if you were one of the family members returning home, room perfectly clean and everything you need in it, the dog seemingly asleep yet obediently alerts it's owner when their is any movement in the front yard or near your car, harmless though, but a "cudie pie none the less" . Your room and surrounding area is kept so private that you hardly notice that there are others sharing the facility with you. Was just like being at home, only better. Trish was great and on my "sleep in" on Saturday morning, breakfast was given to me with a smile despite my late arrival and leaving as early as 6am, Trish was still up and ready to assist. The pool was great, even after midnight as we swam and had a laugh. Over all, I would recommend this place to even the Queen of England, that is how much faith I have in Trish and her Luisa House. 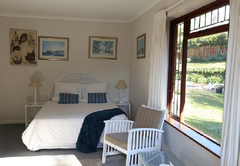 WE STAYED WITH TRISH FOR 5 NIGHTS IN TWO BEAUTIFUL ROOMS.EVERYTHING WAS WELL PRESENTED AND TRISH WAS AN EXCELLANT HOST.HER BREAKFASTS WERE SUPERB.HOUT BAY PROVED A GREAT BASE TO VISIT CAPE TOWN WITH KIRSTENBOSH GDNS JUST A SHORT DRIVE AWAY.WE CANT WAIT TO RETURN TO STAY WITH TRISH. 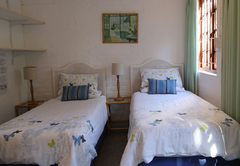 Child policyChildren of all ages are welcome by prior arrangement, a camping cot is available on request.